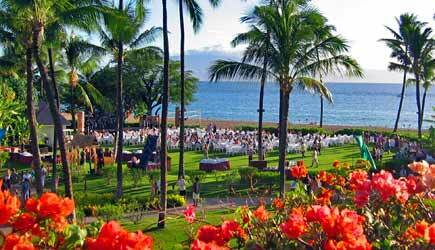 Sheraton Luau grounds are oceanfront at Kaanapali Beach! All the Mai Tais you like! An open bar is included. Seating is at round tables that seat 8. 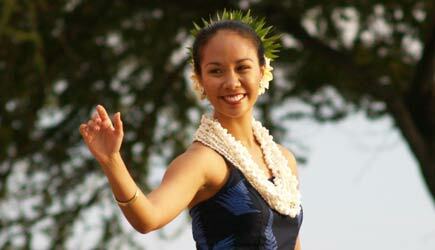 An elegant luau dancer about to perform. ...as well as more modern hula dances. Schedule: Held Monday, Wednesday and Fridays. 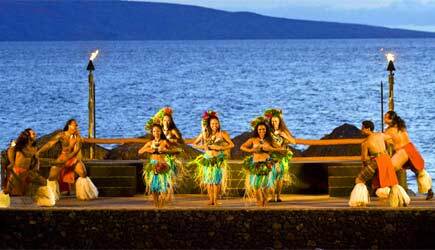 At the Sheraton Kaanapali Maui Nui Luau, discover the remarkable stories, history, and culture of the Valley Isle and Kaanapali through the songs and dances of Maui and the Pacific…..Discover Maui Nui Luau. 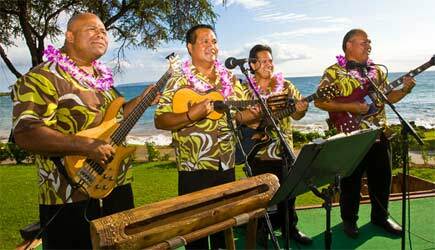 Situated beachfront on award-winning Kaanapali Beach the Maui Nui Luau shares the music, dance and history of the islands right here at the foot of the famous cliff diving point, Black Rock. 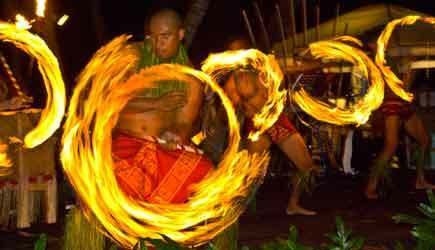 World renowned Polynesian entertainment producer Tihati Productions presents the best in Hawaiian & Polynesian song and dance, including the spectacular fire knife dance. 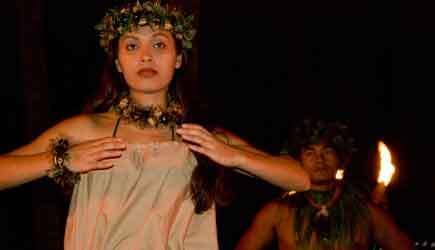 Experience Hawaiian arts and crafts and enjoy an authentic Hawaiian Imu Ceremony. The salad menu includes peppered pipikaula beef and chilled ramen noodle salad, Maui Gold Pineapple dusted with li hing mui powder, and kim chee spiced soy beans. Poi with Molokai sweet potato and coconut milk is a local accompaniment. The main entree menu includes vegetable curry with assorted seasonal vegetables & mild Japanese golden curry sauce, kiawe wood smoked huli huli chicken with grilled pineapple & sweet soy glaze, mini beef hamburger steak with shiitake mushroom gravy, and coconut crusted mahi-mahi with lime butter sauce & mango salsa. 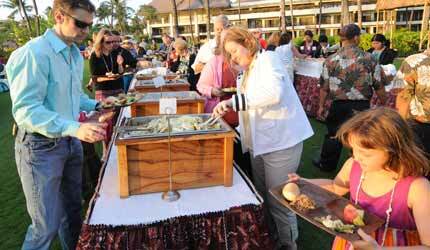 They also offer a "bread or bowl" option, which is a fun and creative way for all to enjoy some of the luau food. You can build your own sandwich or slider with taro rolls, sweet bread rolls, mini hamburgers, kalua pork, coconut crusted mahi-mahi, shredded cheddar cheese, BBQ sauce, and teriyaki Sauce. Or build your own bowl with steamed white rice, ahi poke, Waipoli greens, kalua pork, coconut crusted mahi-mahi, crispy garlic, furikake, bubu arare, spicy mayo, wasabi mayo, and ponzu. Don't forget about dessert! 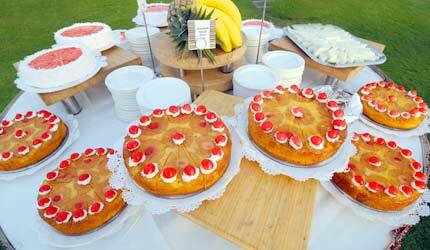 Indulge in lilikoi cheese cake and Pina Colada upside down cake. 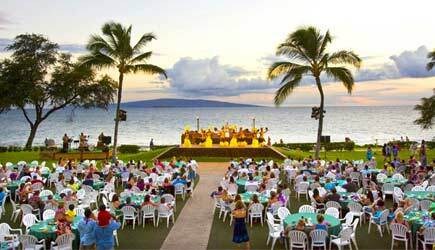 The Sheraton Maui Nui Luau offers the best oceanfront view of any of the Kaanapali luaus ... location, location, location! A premium seating option in the first three rows of tables is available for an upgrade fee of $10.00 per seat... this guarantees you have excellent seats for the show! Premium seating guests also bypass the general admission checkin line. This upgrade fee applies to all seat; even to infants who would are free in general admission. 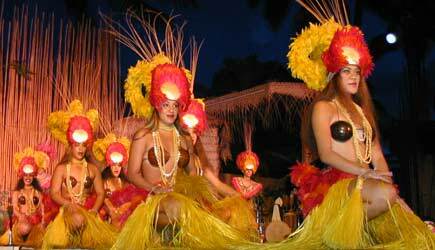 ADD $10pp for luaus on Easter, Thanksgiving Day, Christmas Day, and New Year's Eve. Jan. to May 2019 Shows held every Sunday, Tuesday and Thursday. June to Aug. 2019 Shows held every Sunday, Tuesday, Wednesday and Thursday. Sept. to Dec. 2019 Shows held every Sunday, Tuesday and Thursday. Three-time Merrie Monarch winner Kamaka Kukowa with show choreographer Reri Septirno have redesigned Wailele Luau at The Westin Maui Resort & Spa. 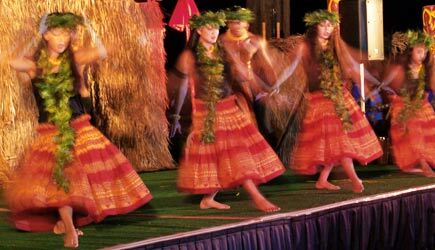 Currently held at the intimate garden setting at the resort's Valley Isle Terrace, the dinner show utilizes the elements of earth, fire and water to reflect the rich Polynesian culture through superb performances with vibrant costumes. 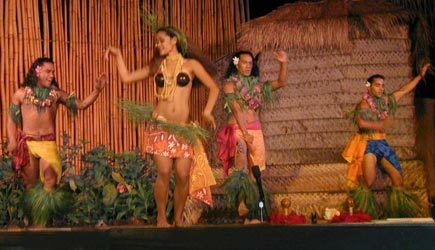 At the Wailelel Luau guests embark on an exciting journey to the Polynesian Islands where dance was considered not just as a form of entertainment, but as means of telling stories. 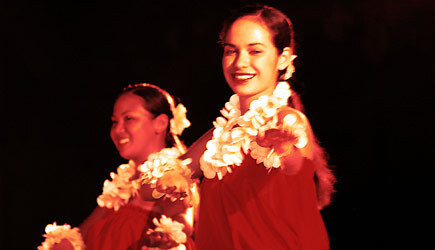 Highlights include the story of Pele, Goddess of Fire and a new performance dedicated to Wailele (meaning waterfalls). 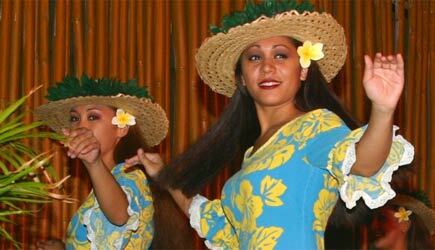 The show also features dances from Hawaii, Fiji, Tahiti, New Zealand and Samoa. 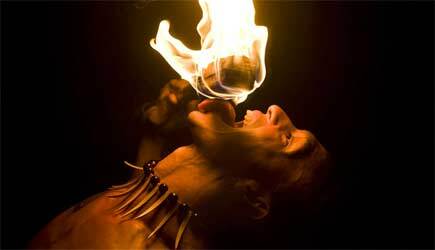 The breathtaking finale is none other than Maui's only extreme fire-knife dance performance led by fire-knife dance champion Martin Tevaga. 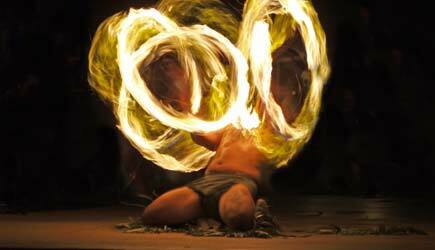 This three to four man fire spectacle is the most impressive of any Maui luau. NCL cruise ship passengers in Kahului are able to do the Westin Luau if they are here during the time of year that this luau is offered on Sunday evenings. A drive of about an hour is required and we can assist you with a rental car reservation. Lahaina cruise ship passengers can do this luau as long as you are here on a night that it operates and your ship is running tenders until at least 10pm. A cab ride of about 10 minutes is required. 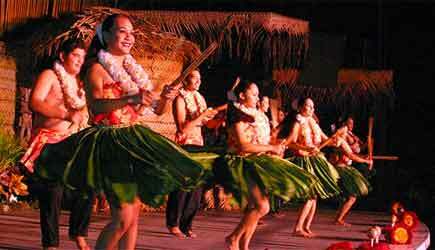 This luau is held every Monday, Thursday, Friday, and Saturday evening. From 1/1/2019 to 3/31/2019 it is also being offered on Tuesdays! 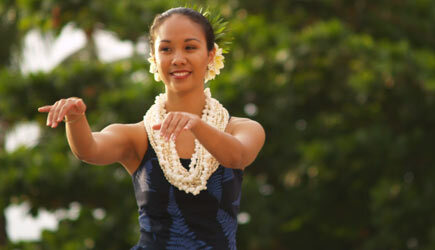 The ocean's tide links the generations of Hawaiians and Polynesians together, and Te Au Moana (the ocean's tide) is an extraordinary luau experience presenting those cultures in food, song, and dance. 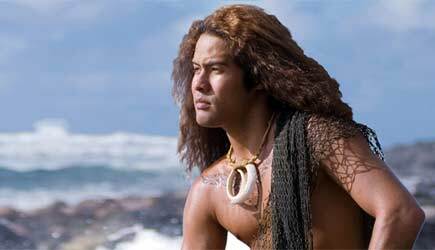 The Polynesians have great knowledge of the earth and ocean and its life giving elements. 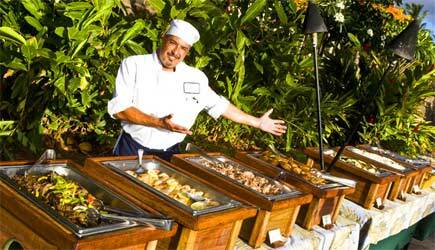 Their expert skill in fishing, gathering, gift giving, romance, and tapa making are brilliantly demonstrated and shared at Maui's newest luau experience. 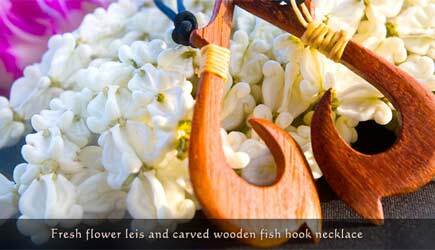 Each guest receives either a fresh flower lei or a wooden fishhook necklace upon entrance to the luau grounds. 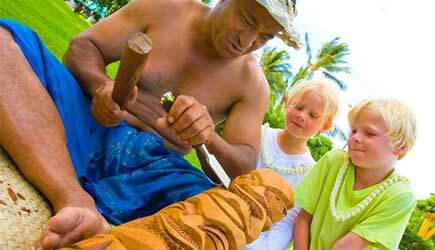 As you stroll around you'll see Hawaiian games, flower crafting, artisans displaying works of tapa cloth and wood carving, and more. 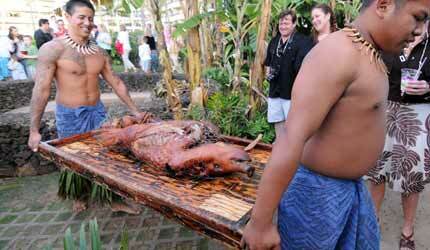 Prior to dinner you'll witness the Imu ceremony as the kalua pig is dug up from its underground oven. The menu for the evening's buffet typically includes seafood pasta, imu baked kalua pork, grilled teriyaki steaks, shoyu chicken, Hawaiian sweet potatoes, stir fry vegetables, poi, and a variety of salads (Kula greens, tropical fruit compote, and salads with an Asian flair). An open bar for beer, wine, Mai Tais, and other mixed drinks is included, and there is a desert bar as well. Dine ... as the ocean sits peacefully before you. 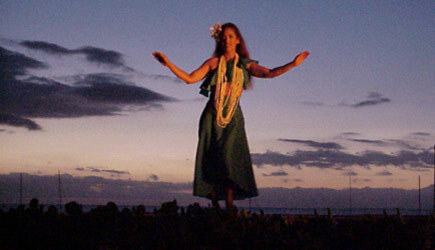 Dance ... under the Maui night sky. 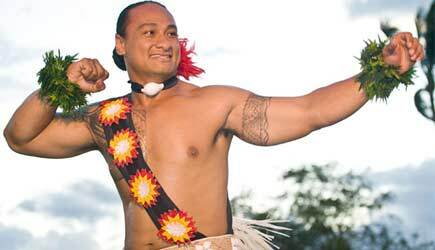 Discover ... the fascinating stories of the Pacific through song and dance presented by Tihati Productions, Hawaii's premier entertainment company. Self parking is complimentary and valet is $35. 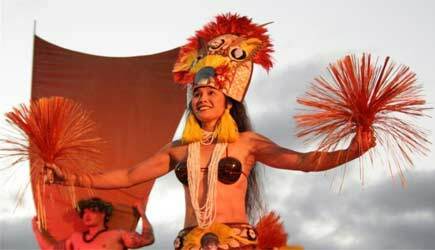 NCL Pride of America cruise ship passengers who come into Kahului are not able to do this luau because it is not held on Sunday nights. 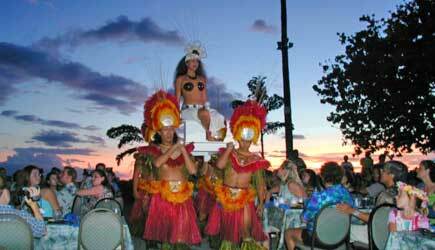 This luau isn't practical for Lahaina cruise ship passengers due to the distance from the harbor. 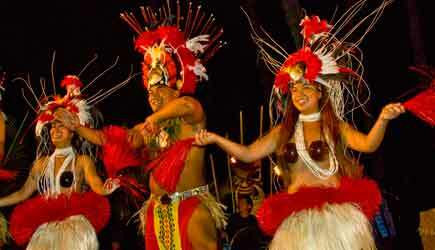 There are other luau options that are much closer in West Maui. Shows held 7 nights a week. Sunday through Friday (closed Saturdays). 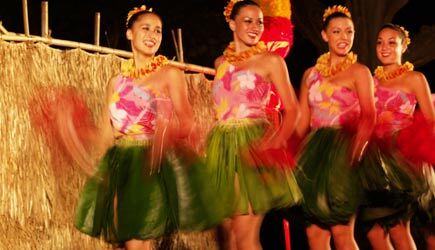 No Hawaiian vacation would be complete without attending a luau, a beachside feast and hula show, and the Myths of Maui Luau at Royal Lahaina Resort is an excellent choice. 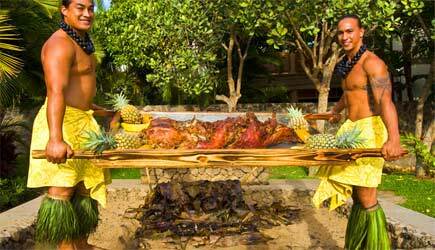 The main course is the kalua pig, cooked all day in the underground imu oven. The all you can eat buffet also includes smoked turkey, a delicious island-style mahi mahi, grilled steak, shoyu chicken, and a huge vegetable and salad bar. This luau is the most kid-friendly ... they even have a "keiki food bar" with hot dogs and chicken nuggets. 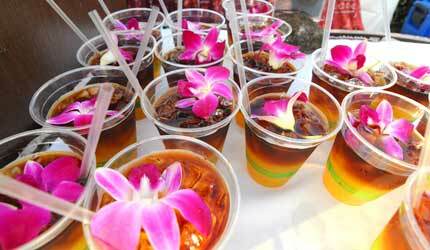 The open bar keeps the Mai Tais flowing from the moment the gates open until the conclusion of the show, which traces the development of hula through the ages. The show concludes with a spectacular Samoan fire knife dance. 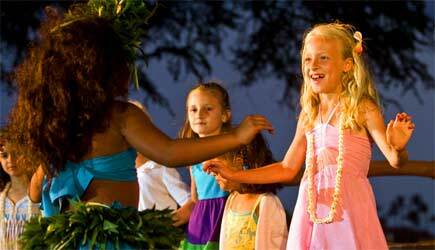 This luau is also a great family value, as children under 12 are are just $30 and infants 5 and under are free. The The luau at Royal Lahaina Resort is a good choice (and affordable) for families (at least in general admission seating where "infants" 5 and under are completely free. It gets a little pricier for VIP seats with a bunch of kid. This luau has a little more of a "local flavor" and they've done quite a grand finale with their Samoan fire dance at the end of the show. 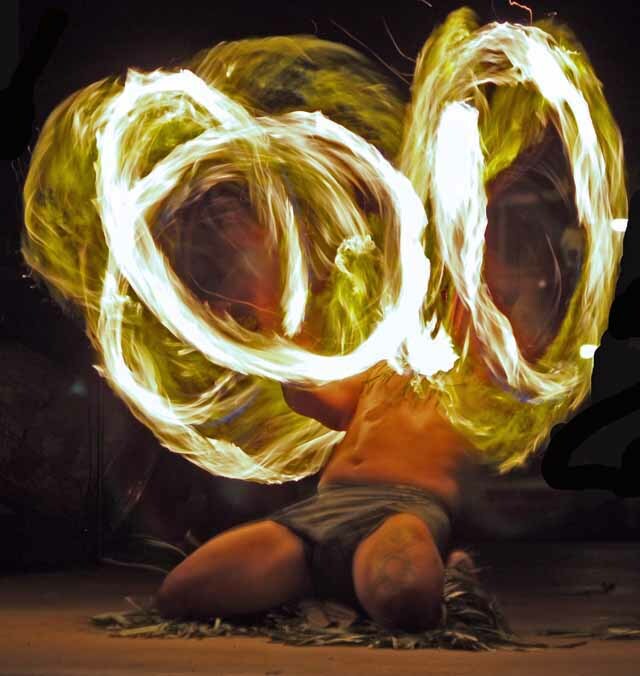 In addition to the main double fire knife dancer they also have two other kane with single fire knifes and several wahine twirling fire poi balls. It's a great photo op at the end of your evening! Monday, Tuesday Thursday, Friday, and Saturday evenings all year. Reserve NOW as premium seating often sells out 3 weeks or more in advance. 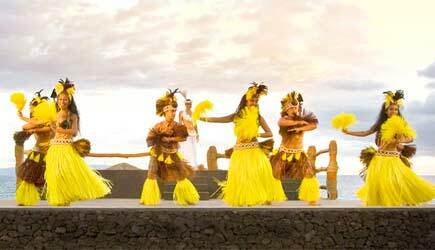 The Grand Wailea is thrilled to become the new home of this luau show, which is titled Honua'ula "Return to the Sacred Lands." 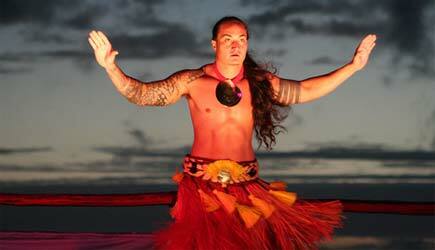 The new show portrays Maui's discovery by ancient Polynesians and the stories and legends told by the peoples of Honua'ula, the area now known as Wailea and Makena. The newly-produced show blends traditional Hawaiian chanting, ancient hula, and some modern artistic interpretations of Polynesian culture into an enchanting evening of beauty. 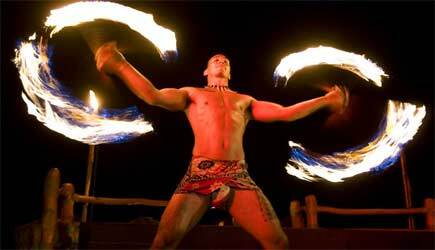 And yes, the Grand Wailea Luau still features the finest fire knife dancer in the state of Hawaii! 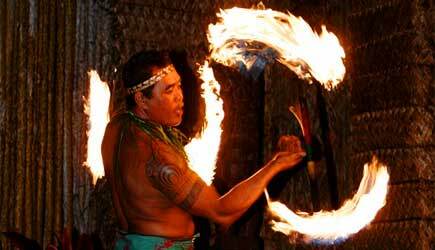 Check out this larger photo of him in action doing the fire knife dance. Premier Seating in the first two rows of tables is available for an upcharge. We highly recommend this option. 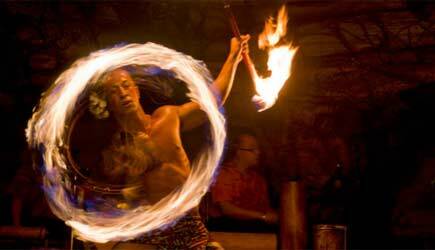 You'll get a great view of the action, especially for the fire knife dance! Premium seating ALWAYS sells out in advance, so don't wait! Reserve your seats now! If you request premium seating and it is not available, we will check other dates during your vacation and contact you to see if the date change is OK with you. If no other dates have premium seating available, we'll book you at regular seating for the date that you requested. 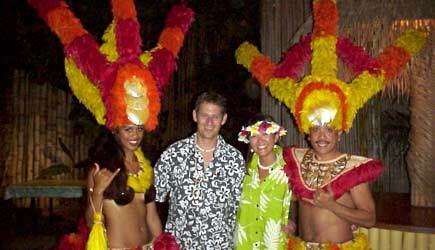 NCL Pride of America cruise ship passengers are not in port on the right night of the week to attend this luau. Lahaina cruise ship passengers should do a luau in Kaanapali because it is much closer to the ship. Hyatt Luau held 7 nights a week. Check In at 5:15pm. 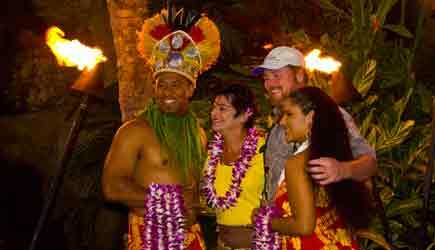 Special holiday rate for luaus on Thanksgiving, Christmas Day, and New Year's Eve apply. Adult General seats are $15 higher, and Adult Preferred seats are $25 higher. CURRENT SPECIAL: One free child per two paying adults! Free child special available in general admission only; Thanksgiving Day, Christmas Day, and New Year's Eve excluded. The sound of the conch, the beating of the drums and the echoes of the Hawaiian chant signal the start of Hawaii's most exciting luau … complete with an authentic imu ceremony and the exotic flavors of native Hawaiian cuisine. 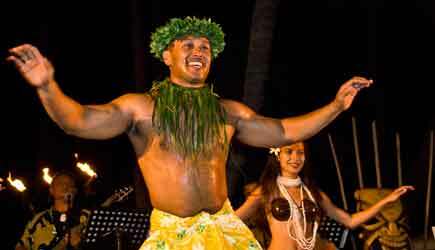 While you enjoy the tastes of Hawaii, the Drums of the Pacific Polynesian Spectacular (a Tihati Production) takes you on a journey through the islands of Polynesia. 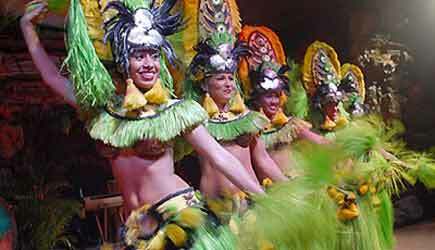 Featured are authentic dances and music of the old Hawaii, Samoa, Fiji, New Zealand, Tahiti, Tonga, and Rarotonga in the hottest luau show in the Islands! 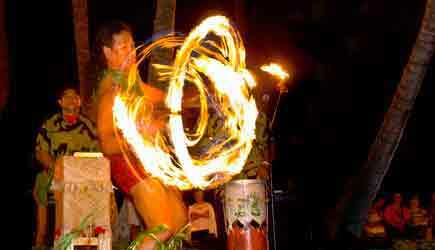 Drums of the Pacific luau features is a three-man fire knife dance finale! A brand new state-of-the-art lighting system was installed for the stage, and the LED lights dramatically improve the show. The costumes pop with colors, and a new haze machine adds a mysterious aspect in some of the dances. Guests are greeted with a lei ... a shell lei for general admission and a ti leaf lei for preferred seating. Your evening begins with Hawaiian music and audience participation featuring hula lessons, poi ball lessons, coconut tree climbing, coconut husking and finally the unearthing of the pig that's been cooked in an underground oven. An all-you-can-eat generous buffet features It features Huli Huli Chicken, Imu Kalua Pork, Macadamia Nut Crust Island Fish, Makamaka Vegetables, Molokai Purple Sweet Potato, Creamed Taro & Leaf with Coconut Milk, Polynesian Fried Rice, Soba Noodle Salad, Fresh Sliced Tropical Fruits, Lomi Lomi Salmon, Pacific Ahi Poke, Kauai Taro-Pounded Poi, Upcountry Baby Green Lettuces, Namasu of Maui Onions, Cucumbers and Carrots, and Taro rolls with Whipped Lilikoi Butter. A dessert bar features Haupia with Toasted Coconut, Creamed Chocolate Macadamia Nut Brownie, and Pineapple Upside Down Cake and Housemade Bread Pudding. An open Tiki bar for beer, wine, Mai Tais, other mixed drinks, tropical fruit punch, juices and sodas are included. A brand new bar allows for guests to enjoy faster service. It's a great Hawaiian Lu'au Feast. They also have a variety of vegetarian items, gluten, daily, and nut free options. The Hyatt also offers a "Keiki" buffet featuring child-friendly options like pasta marinara and chicken nuggets! For those of you who are planning ahead and reserving in advance, don't forget about the PREFERRED seating option! Preferred seats are in the center of the luau grounds in the second row of tables. Preferred guests use the same entrance to the luau grounds as the VIP's of the Hyatt (who get to sit in the first row of course) and are admitted to the luau grounds prior to the opening of the general admission line. They also go through the dinner buffet before the general admission guests. The cost of this upgrade is $15 per seat in addition to our discounted general admission rate posted above and applies to all seats, whether they are for adults, children, or free infants. Please note that the "one free child per adult" special is not available in the preferred section. The Hyatt is now assigning all seats ... even for general admission. This means the SOONER you make a reservation the BETTER your seats will be! Don't wait ... book NOW using the form on the right of the page! NCL Pride of America cruise ship passengers who come into Kahului are able to do the Hyatt Luau if you are in port during the time of year that this luau is held on Sunday evenings. 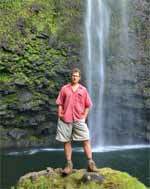 It does require a rental car as the drive to Kaanapali takes about an hour. For rental cars with cruise ship shuttle pick-up see our rental car page. Lahaina cruise ship passengers can do this luau on their first day in port with a short cab ride to Kaanapali as long as your tenders are running until 9pm. 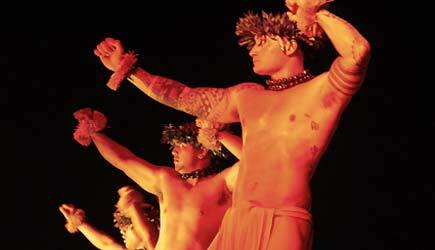 A luau is a must-do event for the first-time Hawaii visitor. 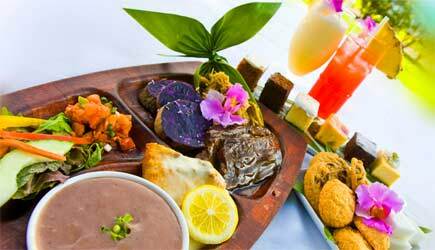 Personally, I never get tired of good food, open bar, sunset views, and Hawaiian music and dance. 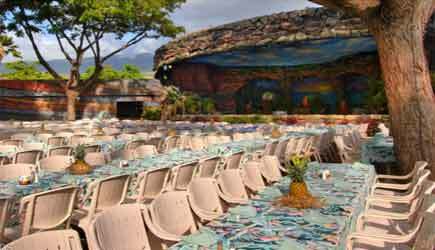 The most important thing about attending a luau is WHERE YOU SIT!!! You are much better off sitting up front at the second best luau than sitting in the back at the best luau. Read that again and let it sink in! If you are ordering a few weeks before your vacation, go with PREMIER reserved seating at one of the luaus that offer that option. It is really nice to be able to walk in the luau grounds a few minutes before the show starts knowing that you'll be able to sit in the first few rows of tables and not get stuck way in the back! If premium seating is not available, we used to tell people to arrive early at the luau grounds to get the best available general seating. That's changing though ... many of the luaus are also assigning general admission seats in advance in the order reservations come in so ... the most important advice for getting good seats at a luau is to RESERVE YOUR SEATS NOW as far ahead of your Hawaii vacation as you possibly can! 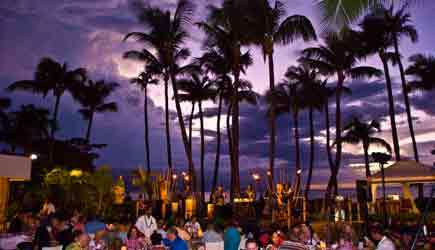 Our favorite location for a luau ... hands down ... is at the Sheraton Resort. 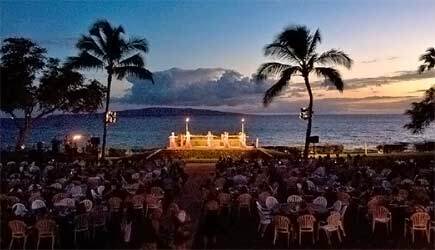 Their luau grounds is located on the grassy lawn right along the beach, and there is nothing obstructing that beautiful ocean view. 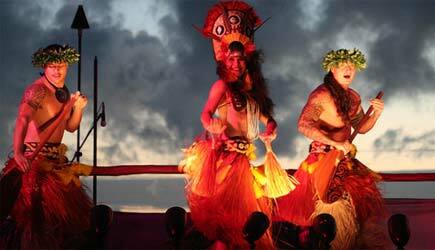 The Wailele Polynesian Luau at the Westin Maui Resort and Spa is another of our top luau choices. We REALLY like the show at this one, and the Westin does a great job with the food too. Their oceanside luau location is currently being renovated, so for most of 2019 the event is being held on the other side of the resort at their garden-view Valley Isle Terrace. This is a very small space; they aren't doing a "premium seating upgrade" at this location because it is really an intimate setting. They are saying "All seats are premium seats" at our luau. If you want dinner and a luau show that is high quality without all the crowds, this is a good choice. 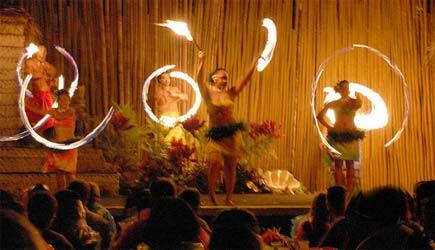 The Hyatt Regency Luau at Kaanapali is famous for offering an energetic show that guests love. Down side here to this luau is that you can't really see the ocean much from any table. The luau ground is almost completely surrounded by wings of the hotel, and the view of the ocean is blocked by a row of shrubbery. It seems odd to be so close to the ocean that you can hear it, but to have your view intentionally blocked. We think it is to prevent people on the beach sidewalk from standing there and getting a free view of the show. On the upside it is now possible to get preferred seating, which will improve your luau experience over being in the general admission section. 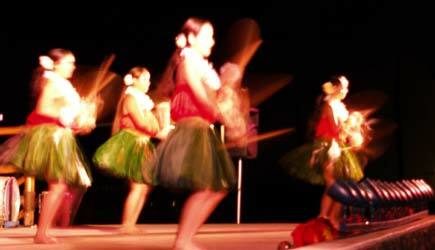 The Royal Lahaina Luau is a good choice (and affordable) for families. They are offering a "VIP seating" option ... the cost of this upgrade is $30 per seat. This luau has a little more of a "local flavor" and they've done quite a grand finale with their Samoan fire dance at the end of the show. 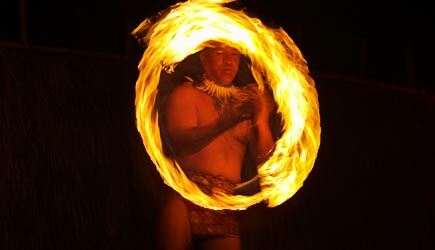 In addition to the main double fire knife dancer they also have two other kane with single fire knifes and several wahine twirling fire poi balls. It's a great photo op at the end of your evening! 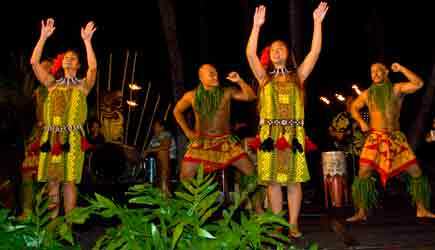 Te Au Moana Luau at the Wailea Marriott and the Grand Wailea Luau are both good choices for people staying down south. 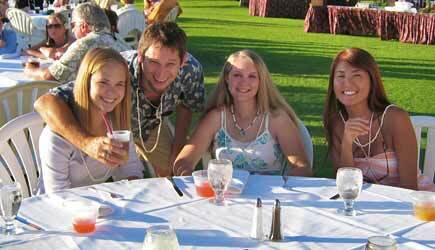 Both luau grounds are located right along the ocean and feature expansive ocean views. The slight advantage here would be the Te Au Moana luau at the Marriott because you face the ocean when you are looking at the stage. The Grand Wailea luau grounds faces the other way; when you face the stage you are looking at the mountains, and when you turn to look at the food line you are looking toward the ocean. This takes the focus off the oceanview a little. If you blindfolded us and had us taste the food, we couldn't tell which one is which. This is a tie here. As for the shows, both are well done. 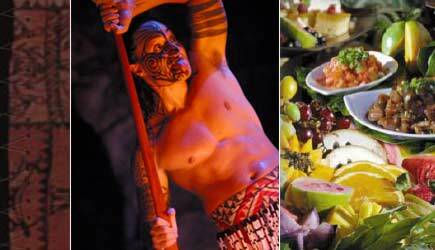 The slight edge would go to Te Au Moana at the Marriott for being a more traditional luau show featuring live musical accompaniment. The Grand Wailea's show is technically excellent, but they use more taped music for parts of the show, and while parts of the show feature traditional dancing, there are some modern elements thrown in (stylistically influenced maybe by Cirque du Soleil).